Caracals are predators and not to be underestimated. They occur throughout the hole the country (except in the Namib desert). They are also referred to as red cats or red lynx. The caracal has a lynx-like appearance, standing up to 50 cm / 19 inch at the shoulder and weighing about 18 kg / 39 lb. (male animals). In Namibia, these nocturnal predators are particularly disliked by sheep farmers, since lambs and sheep are the caracal's preferred prey. This cat species is so quick that it manages to catch flying birds while jumping. Although the Caracal is rarely seen and this only by chance, it can be easily outwitted by photographers as well as hunters through living baits. According to observation and the number of tracks found, this species still occurs in good numbers. Hunting the Caracal, in particular on farmland, would therefore not have a decimating effect. However, the caracal is only rarely spotted. But those who should hunt a Caracal and have to go after it, should be very careful. 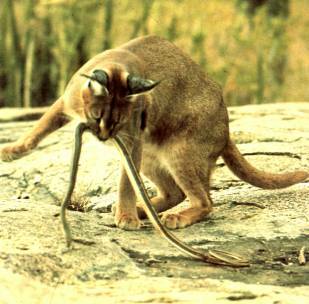 Like any cat, the Caracal would fight for his life until the last minute, using his teeth and claws - rightfully.